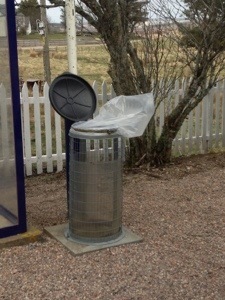 I started spotting the tell tale signs of a slight southwesterly wind on the train north from Inverness. I met Tim on the platform at Inverness station as we were unloading our bikes from the Caledonian Sleeper. Like me he was catching the train to Wick and cycling up to John O’Groats to begin cycling to Lands End, so we got chatting. The train to Wick takes a circuitous route, stopping at Thurso on the North coast before heading SE to Wick, so we decided to jump ship there and cycle there from a different direction to avoid doubling back. 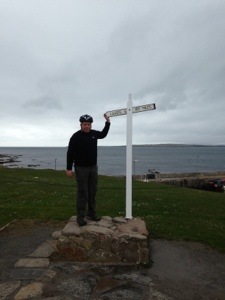 The coast road undulates, and despite a vigorous side-wind we made good progress, completing the 20 miles from Thurso in under an hour and a half before having the obligatory photo on the start line. Cycling west to east I’d averaged 14mph, but as soon as I turned south to cycle to my guesthouse things changed. Sidewind turned to headwind and I could only manage 6mph on the relatively gentle incline as I headed inland. At that rate tomorrows cycle ride will take 20 hours. Oh dear. I retired to the pub to check tomorrows forecasts over a few pints of Orkney Ale, a haggis tower and a Caithness haddock. The consensus is a 20mph headwind. It’s going to be quite a long day.